Once the most endemic country for Guinea worm disease in the world, Nigeria declares victory in its 20-year war. In Ezza Nkwubor village in southeastern Nigeria, 58-year-old Grace Otubo sits on a wooden bench and touches her right heel, recalling where a Guinea worm painfully emerged in November 2008. She didn't know it at the time, but her Guinea worm would be the last one from Nigeria. Twenty years ago, Otubo would have been just one of more than 650,000 victims of Guinea worm disease in her country. Just one of many, many people facing the searing pain of one or more long, spaghetti-like worms emerging from blisters after they had incubated in the body for a year. But today, her worm has made her a minor celebrity. The fact that Otubo can be specifically identified as the final victim of the disease in her country shows the relentless tracking required to eliminate Guinea worm disease. Thousands of volunteers have worked in Nigeria since 1988, documenting every case of the disease and providing the tools and education necessary to defeat it. To keep herself from contracting Guinea worm disease again, Otubo could not take a medicine or receive a vaccine. Instead, she and her fellow community members had to change their drinking habits. Because the disease is transmitted through water, Otubo had to be convinced by health workers to only drink water filtered through a simple cloth, provided free of charge. The message is a tough sell, because the Guinea worm larvae in the water are microscopic, and a full year passes between ingestion of contaminated water and a worm actually emerging from the body. Community members must act on faith. "We are staring history in the face as the public health system of Nigeria is about to make a bold statement of eradicating Guinea worm disease in Nigeria after many years; over two decades of hard fought battle against Guinea worm have now succeeded in defeating it." The Nigeria Ministry of Health has brought the country to this watershed moment with leading assistance from The Carter Center and support from other partners. 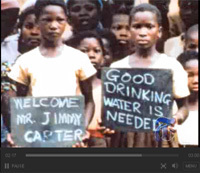 "I congratulate Nigeria on this amazing accomplishment," said former U.S. President Jimmy Carter. 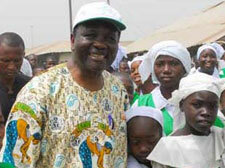 "It would not have been possible without the tenacity of thousands of Nigerians for more than 20 years." Nigeria joins 15 other countries that have rid themselves of Guinea worm disease since 1986. Niger, Nigeria's northÂ­ern neighbor, also eliminated the disease in 2008, and thus reported zero cases for the first time in 2009. It is estimated that in 2009, fewer than 3,500 cases of the disease remain in four African countries. While Nigeria continues surveillance for Guinea worm disease over the next three years so that it can be officially certified by the World Health Organization as free of the disease, experts are focusing on how to repeat Nigeria's success in the last strongholds of the disease in southern Sudan, northern Ghana, and eastern Mali. Meanwhile, Ethiopia is fighting just a few remaining cases. 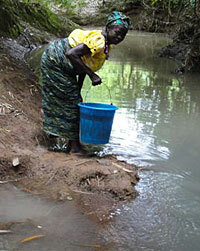 Grace Otubo collects water near her village in southeastern Nigeria. Otubo was the last victim of Guinea worm disease in her country.